Yesterday was the first day in a long time that the weather was cool enough to fire up the oven. With cherries in the freezer and a few cherries still on the tree and ready to be picked, I made a cherry crisp. 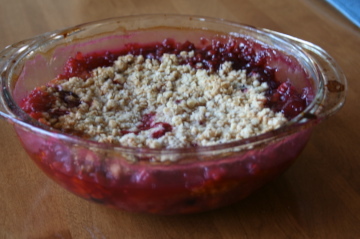 Unlike a cobbler, which is typically made with a batter, such as this wonderful raspberry cobbler, a crisp involves a crunchy topping of butter, sugar, flour and oats. My topping tends to be more oat-y than crunchy, but that way I can eat it for breakfast (with yogurt) and only feel a little guilty. Put 6 cups of cleaned fruit (I used 4 cups tart cherries, 1 cup blueberries, and 1 cup strawberries) in a baking pan and squeeze the juice of 1/2 a lemon over it. Mix together in another bowl 1 cup sugar (may need more if cherries are very tart or less with sweeter fruit) and 1/2 cup flour (do not skimp!). Pour the sugar/flour over the fruit and mix thoroughly. In the same bowl that you mixed the flour and sugar, mix together 1-cup oats, 1/2 cup flour, 1/2 cup sugar, 1 teaspoon cinnamon, and 6 tablespoons butter (melted). Mix well to distribute the butter. Then, spread this over the fruit mixture, and bake it all for about 1 hour in a 350 degree oven. It should be bubbling slowly, indicating that the fruit is thickening. Let it cool and serve with whipped cream or ice cream for a dessert. The nice thing about a crisp like this is you can vary the amounts of sugar, butter, oats, etc., to your own taste. It’s almost impossible to ruin a crisp. Cherry anything is my favorite! And crisps are so much easier and cooler to make than pies on a hot summer day. Only the oven gets hot. A la mode is always an option too. Fruit crisps are my absolute favorite! Even better than pies in my opinion since I don’t like pie shell pastry. This one looks amazing.